There’s a reason polyiso rigid foam insulation is used in more than 70% of commercial roof construction, as well as in many residential builds. 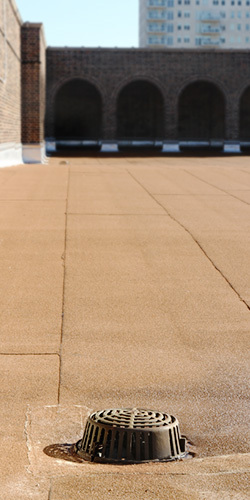 Polyiso is an easy, cost-effective, sustainable and energy efficient construction material. All Atlas ACFoam polyiso insulation boards are QualityMark™ certified, providing consumers an easy way to identify premium products that meet or exceed building codes for the best in roof performance. The Atlas ACFoam family of products delivers unparalleled performance and energy efficiency that’s built to last. From pre-cut crickets to complete insulating and ventilating roofing systems, Atlas innovation means your roofs will perform excellently, no matter the job. ACFoam products are proven to deliver premium performance and lasting energy efficiency. From business districts to warehouses and manufacturing facilities, Atlas ACFoam roofing products can be trusted to perform across all your installations. Explore the many attributes of our roof insulation below. Atlas ACFoam products contain a polyiso core, which achieves higher effective R-values (the capacity to resist heat flow) with minimal material thickness. Polyiso is the only foam roof insulation that can be used without the need for an additional thermal barrier. ACFoam® CrossVent® is a thermally efficient cross ventilated non-structural composite roof insulation. Consisting of ACFoam®-II or ACFoam®-III polyiso insulation board and OSB or CDX plywood separated with and bonded to 5 individual Expanded Polystyrene vent spacer strips. Atlas offers accessories to promote airflow. Techni-Flo® Engineered Ventilation System features a unique design that promotes positive air intake at the eave, limiting heat build-up, helping to evacuate moisture, thereby ensuring a longer roof system life. Our full state-of-the-art ventilation system, including Techni-Flo, is specifically designed to create consistent air intake and exhaust under the roof covering. Atlas ACFoam products are available with a variety of facer materials. Both impermeable and semi impermeable options help keep harmful moisture out. All Atlas ACFoam products pass the ASTM E96 water vapor transmission test. In fire testing, polyiso chars in place and doesn’t melt or drip like other foam plastics. Atlas ACFoam boards are backed by extensive listings for UL Class A, B & C roof assembly fire exposure classifications. Atlas ACFoam products can help earn LEED® credits and meet federal, state and local green building laws. Our manufacturing processes are sustainable and responsible, with polyiso using fewer resources for highest insulation levels, thanks to its high R-value per inch. Our roof insulation products have zero ozone depletion potential (ODP) and virtually no global warming potential (GWP). Atlas Tapered ACFoam products include accessories like the Gemini™ Drain Set. This is the industry’s first one-piece pre-cut drain sump. The Gemini Drain Set is the only 4’ x 4’ drain sump that requires no assembly by the contractor. The dimensionally stable Gemini Drain Set provides a 4-way slope to the roof drain to prevent ponding and premature roof failure. When it comes to insulation performance, the difference is in the details. With premium polyiso manufacturing, Atlas is able to produce the highest effective R-values with minimal material thickness. All products in the ACFoam Polyiso Roof Insulation family are closed-cell, rigid foam insulation board—flat or tapered. Take a closer look and the choice will be clear. Purchasing a roof and its components is not a one-time, short-term expense. Investing in the right materials up front has a lasting impact on cost and energy savings over the roof’s life span. Roof insulation can influence moisture, mold, fire resistance, air quality and other factors that will impact a building today and in the future. Atlas thinks outside the insulation board box to provide its customers the best product for their needs, at the best value.